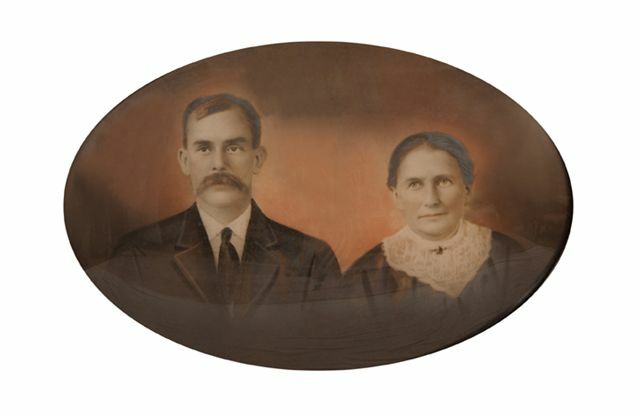 Photo of Josh and Mary Jane Crook.click on photo for larger view. .
Joshua Crook was born in 1860 and died in 1932. He married Mary Jane Thomas on Apr 2, 1887 in Union Co., NC. Per his marriage license, he was the son of Phoebe Crook and Wesley Hinson. Mary Jane Thomas was born in 1862 and died in 1947, the daughter of Jacob Thomas and Hester Jane Holly. Their children were: Dora Crook (md. Joseph Adam Clontz), Cora Crook (md. Augustus 'Gus' Medlin), and Odessa 'Essie' Crook (md. 1st ___ Moser, md. 2nd Martin Ross). Both are buried at Union Baptist Church Cemetery, Lanes Creek Township, Union Co., NC.